MAUI 44, PA Package (Sub + Satellite) from LD Systems in the MAUI series. LD System introduces at the NAMM Show 2014 a new column array in the MAU Series. The MAUI 44 comprises a 2x12” neodymium subwoofer driven by two UCD400 power modules that can be independently switched in order to allow for the separate amplification of the four voices with their own 200W Class D amps. The subwoofer is completed with a dual full range column featuring 16 x 3.5” speakers and two 1” Celestion tweeters with a waveguide. The system can provide a total power of 1600W RMS and handles a maximum sound pressure of 129dB SPL. 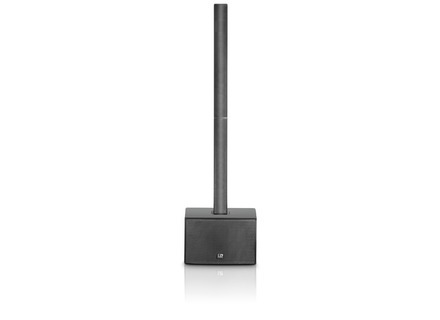 LD Systems announces a horizontal dispersion on 120°. You can separately adjust the column and subwoofer levels and LD Systems included a digital processor and a dedicated limiter. The subwoofer enclosure is made of 15mm of birch and weighs 40kg, while the weight of the column is 17.8kg. The MAUI 44 price is 1999€. [NAMM] TC Helicon FX150 floor monitor TC Helicon introduces at NAMM 2014 the new VoiceSolo FX150 two way active full-featured floor monitor. Alcons introduces the RR12 point-source array Alcons adds to its catalog the RR12 point source array, a loudspeaker equipped with the patented Pro Ribbon technology. New Meyer Galileo Callisto 616 AES processor Meyer Sound will release in February, 2014, a new digital sound processor in the Galileo Callisto Series.